In technology, these are similar to the mobile condensation dehumidifiers. However, these are higher capacity machines suitable for floor or wall installation . The operation principle is condensation of atmospheric moisture and conversion into water. This range comes in various models starting from a capacity of 22 litre/24 hours to 1,040 litre/24 hours. 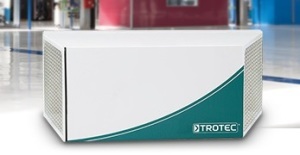 The DH series is especially useful for high-temperature atmospheres. 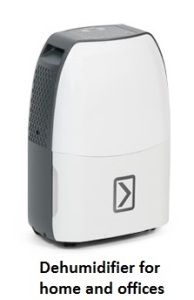 DH 15 AX is the smallest in the series of DH series Industrial dehumidifiers. Maximum air volume capacity is 225 m³ per hour. Operating temperature range is from 0 to 40 °C. Operating humidity range is from 30 to 90 % RH. Electrical power requirement is 230 V, 1 phase, 50 Hz. Electrical power consumption is 0.43 kW. Heat emission while using at full capacity is 0.9 kW. Sound level at a distance of 1 meter is 53 dB. The dimension of the condensation dryer is 363 mm (Length) x 825 mm (Width) x 320 mm (Height). The weight of the machine is 33 kg. This is the biggest one in DH series of condensation type industrial dehumidifiers with a capacity of 1,040 litres per day. Also, this model is capable of operating up to a lower temperature range of up to -15 °C. Max. air volume capacity is 9,000 m³ per hour. 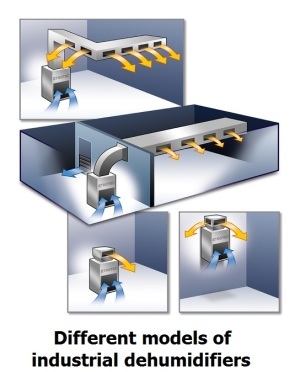 Operating temperature range is from -15 to 40 °C. Electrical voltage requirement is 400 V, 3 phase, 50 Hz. Heat emission while using in full capacity is 29.7 kW. The dimension of the dehumidifier is 1,250 mm (Length) x 1,730 mm (Width) x 1,600 mm (Height). The weight of the dehumidifier is 497 kg. This dryer has an automatic defrosting system. Max. air volume capacity is 1,100 cubic meter per hour. Operating temperature range is from 5 to 32 °C. Operating humidity range is from 30 to 100 % RH. Electrical requirement is 230 V, 1 phase, 50 Hz. Electrical power consumption is 1.9 kW. The dimension of the dehumidifier is 465 mm (Length) x 600 mm (Width) x 910 mm (Height). The weight is 65 kg. 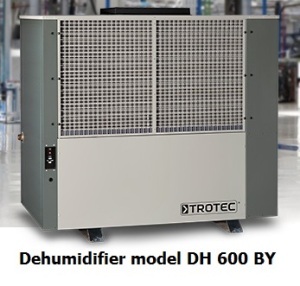 Please click the following links for other types of dehumidifiers by Trotec, Germany.